The final Guild meeting for the year has yielded some major changes for Murdoch students, with the axing of some Guild positions, changes to the Clubs Room and tough financial decisions. 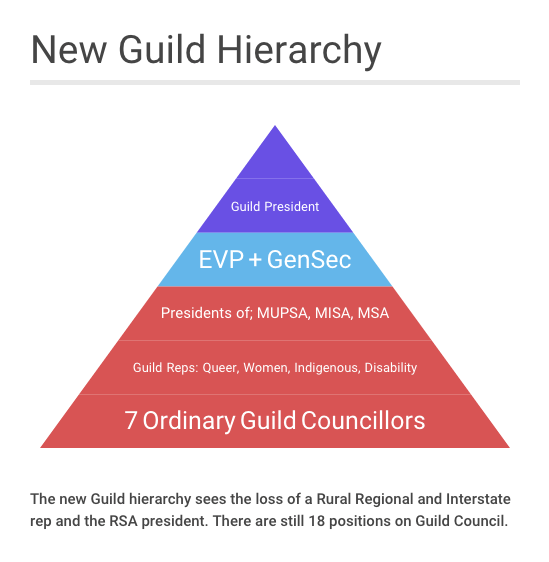 The outgoing guard, helmed by Raeesah Khan, have removed a number of Guild Council positions, including the Rural Regional and Interstate representative and closed the Rockingham Student Association (RSA). The RSA was considered obsolete in a campus that has less than a dozen students. No RRI representative had been elected in the recent elections, a position last held by Alex Knoop. In a move that has been floated for several months, the five Guild Councillor positions of Sports, Clubs and Socs, Events, Sustainability, and Social Justice have been axed to make way for seven ‘Ordinary Guild Councillors’. These positions, according to the agenda, will be ‘voted by quota to council’, similar to voting in the Australian Senate. Students seeking election as an Ordinary Guild Councillor will need to attain 12.5 per cent of the vote after preferences, with portfolios allocated to them by Guild Council. “It means duties can be flexible with the changing times,” says outgoing Education Vice President Roland Belford. Guild President Guy McDonald says the changes will need to go through Senate, and will affect the election scheduled for late 2016. A unanimous motion was passed to reallocate the Clubs Room to the Indigenous Collective. Outgoing Clubs and Socs officer Brodie Skalko says the Guild wants to build up the Indigenous Collective, who before this did not have a room. “The Indigenous Collective have a hierarchy structure that they can use to ensure the room is looked after,” she says. Located in the Amenities block, the Queer and Women’s Collectives will also swap rooms, giving the Queer Collective three square metres more room and wheelchair accessibility. “We’ve got a large number of active members and until now have had a space that was far too small, so it’s great that we’ve finally been able to expand a little,” says outgoing Queer Representative Ash Spring. At the meeting held on November 30, the council opted to keep the loss-making Guild Bookshop open after heavy discussion on cost-cutting measures. 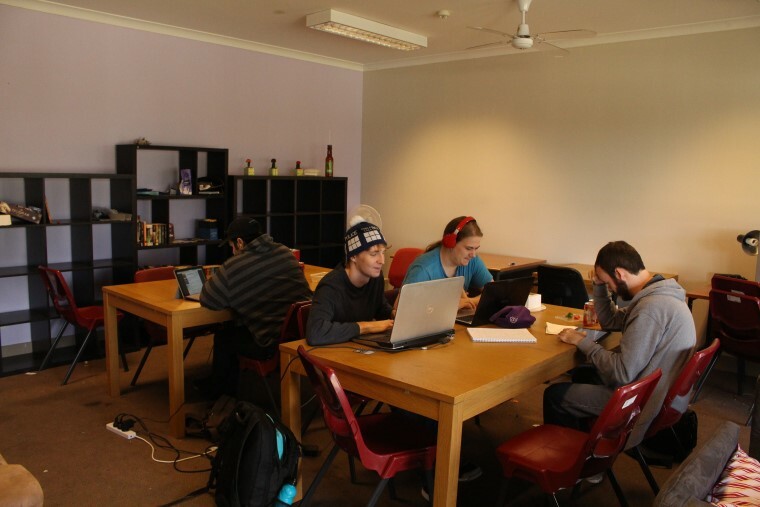 Although the closing of the bookshop would have saved almost $50,000 in SSAF money, the risk of losing vital services such as the sale of second-hand books, Guild sticker distribution and Student SmartRiders proved too high. In order to keep the bookshop open, the positions of Guild Shop manager and assistant manager have been made redundant, while the Tavern assisting manager will be made a casual position. The operating expenses for the bookshop is budgeted at $230,000 for 2016 but revenue should offset a bulk of the cost. The Clubs and Socs Room now for the Indigenous Collective. Council has also offered guidance to the architects of the planned student hub. In what is described as an ‘ambitious’ plan, the Student Hub is expected to take over much of the Refectory side of Bush Court and is slated for 2017. The Guild passed a motion to endorse a dedicated spaces for Indigenous students close to Kulbardi, queer-identifying students and women. Murdoch’s student representative body also wants “the entire student hub project to utilise best practice in accessible building design” for inclusion of students with disability. In collaboration with the current editor, outgoing Education Vice President Roland Belford wrote a new METIOR policy to reflect the publication’s move to online. Changes were made to the selection process of future editors; with the new policy ensuring the next person “shall be appointed from among the Murdoch student body by the Guild President and outgoing Editor”. In the old policy, it was “recommended” that the METIOR editor be a current or previous student of the university. The magazine is in the process of securing at least one print run, with the edition out by February 22, 2016.